Villa Saureto: 3-bedroomed semi-detached villa with free Wi-Fi, located in French coastal AOC wine village of Fitou. Extensive sandy beaches of the Mediterranean within 10-15 minutes drive, and wild, rugged, semi-mountainous terrain 'on the doorstep'. Residents' pool complex ( 2 pools + toddlers' pool). One pool is heated in April, May, June, September and October. Satellite and internet TV with UK, French and other European channels. Sony DVD/CD music system with USB input. Selection of DVDs provided. The air-conditioning is integral to the construction of the villa and is therefore silent (no noisy bolt-on units or fans). It can be used for cooling or heating, and has individual room controls in the lounge-diner and bedrooms. Sea-view terraces for al-fresco dining on two sides of the villa with gas BBQ. A fenced, irrigated Mediterranean garden at the rear of the property suitable for sunbathing, with rockery and shrubs. Adjacent to vineyards and surrounded by the protected environment of the Languedoc-Roussillon 'garrigue', with spectacular panoramic views. The area, forming part of the vast Regional Natural Park of Narbonne in the Mediterranean, is within easy reach of the Pyrénées and has more days of sunshine, on average, than anywhere else in France. The villa is 1km from the centre of the village, its Xth-century chateau and many wine 'caves'. Several delightful and affordable restaurants within walking distance. This is 'Cathar country', on the border of Northern Catalonia; the scene of many historic wars between France and Spain, and conflicts between the Cathars and Catholics. The ancient Spanish border fort at Salses (now French) is just a 10-15 minutes drive to the south, and the current border about 35-40 minutes. Bed linen, towels (exc. pool/beach towels), and normal cleaning are included in the prices. The usual changeover day is Saturday, although there may be some flexibility during off-peak periods. Tourist Tax (Taxe de Sejour): The new "Corbières Salanque Méditerranée" regional authority has introduced a tourist tax which we are obliged to collect. The tax will be additional to the rental and identified in your quotation/invoice. english, french, Correspondence also in other languages by email. Silent, integrated air-conditioning. Wi-Fi. UK, French and other European TV. Sony DVD/CD system and iPhone Speaker. Gorgeous lake and sea views from the villa. 2 shared residents' pools and a toddlers' pool on site. 1 adult pool heated (except high season). Fenced rear garden with shrubs and rockery. Lit terraces (one covered). Gas bbq. AOC Wine village. Excellent restaurants within walking distance. Very short drive to extensive sandy Mediterranean beaches. Located within the protected regional environment of the Narbonne Natural Park. 1) Bathroom with bath and shower attachment, wc, lit vanity unit with wash-hand basin, heated towel dryer, hair dryer. 2) Separate shower room with wc, wash-hand basin and shower enclosure. Fitou is located in rocky semi-mountainous terrain in the outer foothills of the Pyrenees. Fitou is an ancient wine village with many vineyards and wine outlets. Silent integrated air-conditioning which can be set for heating or cooling, with individual room controls. Except for cots. Please bring your own bedding for the cots. 2 private parking spaces ( to side and front of villa), plus garage (see notes on garage). Free Wi-Fi. UK TV via internet. Except beach/pool towels. Towel drying racks. Lounge/diner with 6-seater dining table, 2 sofas, coffee and console tables, satellite and internet TV, music system (+DVDs). High chair provided. Gorgeous views of the lake and the Mediteranean. The modern kitchen is well-equipped, having an oven with ceramic hob, microwave, fridge/freezer, washing machine, dishwasher, iron and ironing board. Satellite and internet TV with live French, UK, German and other European channels. Sony CD/DVD system including USB input. Sony CD/DVD system with USB input facility and a selection of DVDs . Small assortment of buckets, spades and beach balls etc. Enclosed rear garden with shrubs, rockery and dining/sun-bathing area. Boat hire is available at Porte Leucate, about 15 minutes drive from the villa. Boat trips available from Porte Leucate to other ports. Lit terraces with bistro sets for al-fresco dining to side and rear enjoying gorgeous sea views. The side terrace has a glass balustrade; the other is covered and overlooks the rear garden. Available for hire nearby in Leucate. Storage space in garage. Ski resorts at Font Romeu and Les Angles can be reached in about 1hr 45mins. Golf at St Cyprien, some 40 mins or so along the coast offers 27 holes (par 73) over 2 courses at "Etang-Canigou", and nearby "La Forêt" provides a 9-hole (par 35) course in the forest. 2 residents' pools (one heated early and late season) and a toddlers' pool within very short stroll from villa. Security-gated with access via proximity key (included with villa keys). Integrated, silent air-conditioning (no noisy bolt-on units or fans!) for heating or cooling, with individual controls in each room. 2 large fold-up cots (excluding bedding) and a high chair provided. Double-glazed throughout. There is an integral garage, accessed from within the villa, and additional parking spaces. Free Wi-Fi is provided in the villa a local bars, restaurants and shopping areas. Please note that the villa is a NON-SMOKING property and we regret that we cannot accept pets. Outside: There are raised terraces around two sides, and irrigated rockeries bordering a white-gravelled garden area - suitable for sunbathing and alfresco dining. Bistro table sets and 3 sun-loungers are provided. A shared residents' swimming pool (heated early and late summer season) is open from the beginning of April until the end of October, weather permitting. In addition, a larger swimming pool and kiddies' paddling pool are open from the beginning of June until the end of September. The pools are about 60 metres from the villa (entrance about 90-100 metres) . Utility Room: The villa does not have a utility room, but sports equipment, motorcycles, bicycles and large toys etc., can be stored in the integral garage, which can be accessed from within the villa. Cleaning / Towels / Linen / Maid Service: Fresh towels (except beach/pool towels) and bed linen (except for cots) are included and changed weekly. Our caretaker-manager speaks French, English and German. The villa has terraces with lighting on two sides (one covered). Each is provided with bistro tables and chairs. There are sun beds and a gas BBQ. Free Wi-fi. French, UK, German and other European TV channels. We had a lovely stay in this villa. It is beautifully presented with a gorgeous view to lighthouses and the sea. It's got all the equipment you need including beach toys for the kids and little touches like dishwasher tablets etc. Peter the owner was very helpful including arranging the posting of a forgotten item. It is a very quiet complex but it meant we often had the pools almost to ourselves, which was great. Fitou is a small traditional village and the beaches nearby are beautiful, if sometimes fairly windy but it was refreshing in the summer heat! We were very pleased to hear that you enjoyed the peaceful surroundings of the villa, and the pools - and, of course, the lovely view to the Med. The village of Fitou is steeped in history. Located on the Via Domitia, a roman road linking Italy to Spain, it was developed from a feudal castle in the 10th century, suffering many invasions and conflicts throughout the medieval period. Invaders nowadays are a more peaceful lot, coming for the wine, sun, nearby Mediterranean beaches and the varied scenery. It can indeed be fairly windy, at times, much to the benefit of wind/kite surfers who are drawn to the area. Hopefully the dishwasher saved you time spent slaving over the kitchen sink. Not what you what to be doing on holiday! Thank you for your kind review. We hope you'll come again. Although only a few kms from the hustle and bustle of the Mediterranean coast, the villa does indeed provide for a peaceful and relaxing holiday. It was great to hear that you really enjoyed your stay, and found all you needed there. Many thanks for your review. We hope you'll be back. We really enjoyed our stay at Villa Saureto, helped by the very welcome ‘welcome pack’ on arrival with some essentials and a bottle of local wine. The villa was very clean, tidy and spacious with everything you could need on holiday - a real home from home - with lovely views out to the Med from the verandas and two excellent pools which the kids couldn’t stay out of! Even in the peak of August the pools were not overly busy. Fitou itself is small but charming with a couple of very good restaurants and excellent wine Caves, with some worthwhile local tours of local wine makers premises - Cap Leucate (free tickets from the welcome pack!) and Terra Vinea, etc. Be careful with how much wine you ‘taste’ however if driving! We used the villa as a convenient base for day trips to Carcassonne, Toulouse, Narbonne, Perpignan and Collioure which were brilliant for culture, food, shopping and the typical French summer atmosphere. There are plenty of varied things to see and do in the region and the villa was well suited to relaxing and re-charging. I would highly recommend and would love to return again in the future. Thank you for such a comprehensive review - and guide! You appear to have made the most of your holiday, with visits to the many attractive locations and features of the region. Both Fitou and Leucate offer a selection of good restaurants, including perhaps a couple more in Fitou that you have yet to find; and within a reasonable walking distance. The local wine 'caves' are indeed worth a visit, and you don't have to drive to the ones in Fitou - unless collecting a case or two on another day! We hope you'll be back with the children in the future. This is a beautifully kept and well presented villa with Mediterranean views from the lounge and patio. As the owner says it is fully air conditioned, and this works really well - which was much appreciated as we had a very hot week (August 2018). This villa is well situated whatever your taste in holiday. Beaches are a short drive away, there are historic sites close by with Fitou chateau within walking distance, and there is a swimming pool a few yards away. You certainly had a very hot week. That's when air-conditioning really improves one's holiday experience. We are fortunate to have the villa located where it suits a wide variety of holiday interests; with views to the Leucate Lagoon and the Mediterranean, nearby beaches, hill-top castles, chateaux and local vineyards, and a backdrop of the Pyrénées to the villa site. Many thanks for your review. It will be a pleasure to have you visit Villa Saureto again. Stayed for a week in July. Had a great time. Villa was very clean and had a great view and everything that we wanted (aircon was very welcome). We used the communal pool every day, which wasnt crowded and there were always plenty of loungers. The Fitou wine festival was excellent for both adults and kids. Would highly recommend. Thank you very much for writing a review, and for such a nice one. The pools are rarely overcrowded, although they can get busy during the school holiday periods. However, they do provide an opportunity to get to know a few neighbours, if a common language can be found. Children seem to communicate easily and make friends whatever languages or signs are used. You were lucky to pick the week which included the Fitou wine festival. Hopefully there will a few bottles left for our next visit. We hope you are tempted to return in the future. Thanks again for booking the villa. Excellent stay - comfortable and easy! Peter and Janet were the most excellent hosts. They provided all the information you could want from a host and answered any questions I had about the location or the property and very quickly too! Once in the property, it was perfect for myself, my husband and my 3.5 yo son. The pool in the complex was really useful and the villa had everything we needed and if we didn't know how to use something, instructions were everywhere! The villa was well equipped, was spacious and had leaflets on what's around the area too. It had air conditioning, outdoor seating, clothes dryer rack, also had English TV for us to watch! The surrounding area was ok - a little further out from town and from the coast but it meant it was quite secluded and quiet. Thank you so much - really great villa! Thank you very much for your kind words and detailed review following your late-summer holiday. The main reason we purchased the villa was its location, being just a very short drive to the Mediterranean beaches from a peaceful environment and benefiting from the beautiful sea and lake views. The on-site pool complex was a bonus. We were pleased that you were able to relax - even with your 3.5 year old! We look forward to you returning. The region is very much sought after by wine lovers, wind-surfers, sailing enthusiasts, hill-walkers, mountain-bikers, bird-watchers, artists, and those just seeking to relax in the sunniest region of France on the miles of sandy Mediterranean beaches. The nearest sandy beach is at l'Étang de Leucate (Leucate Salt Lake), about 7-8 minutes drive, and is very popular with wind-surfers. Nearby La Franqui's long flat sandy beach is another wind-surfer's paradise. Equipment hire is available locally. At Leucate Plage (10-14 mins drive) you will find extensive sandy beaches on the Mediterranean and a choice of seafront restaurants. Porte Leucate with boat and cycle-hire facilities, bars,a cinema, nightclubs, restaurants and beaches, can be reached in less than 15 minutes from the villa. Perpignan (Rivesaltes): Aer Lingus, Flybe, Ryanair, Air France. Carcassonne:Ryanair. Nimes:Ryanair. Montpellier: EasyJet, Ryanair, Air France and others. Toulouse: EasyJet, Flybe, British Airways, Air France and others. Leucate station (10 mins) is the nearest local railway station. A car is essential. You can hire one at any of the airports or at Narbonne and Perpignan railway stations. Allow for one or two overnight stops en route, if you drive from the UK. Fitou village centre is 15 mins walk downhill - and perhaps a little longer uphill on the way back! Short-cuts will take you through vineyards and around the Xth century chateau, although some tracks are rather rugged in places. Leucate village is a 10 min drive, with Perpignan and Narbonne each under ½ hr's drive. For Andorra, allow 2½-3 hours each way. It's a spectacular drive, but not for the faint-hearted! You can also take a long ride up into the Pyrénées on the 'Little Yellow Train'. Brochures will be found in the villa. Fitou is renowned for its excellent AOC accredited wine. There are around 13 wine 'caves' in the village and the immediately-surrounding areas. These are open most days throughout the year for tastings. You can purchase a decent wine directly from a vineyard owner for around 5 or 6 euros per bottle or some really excellent ones from about 8 euros. 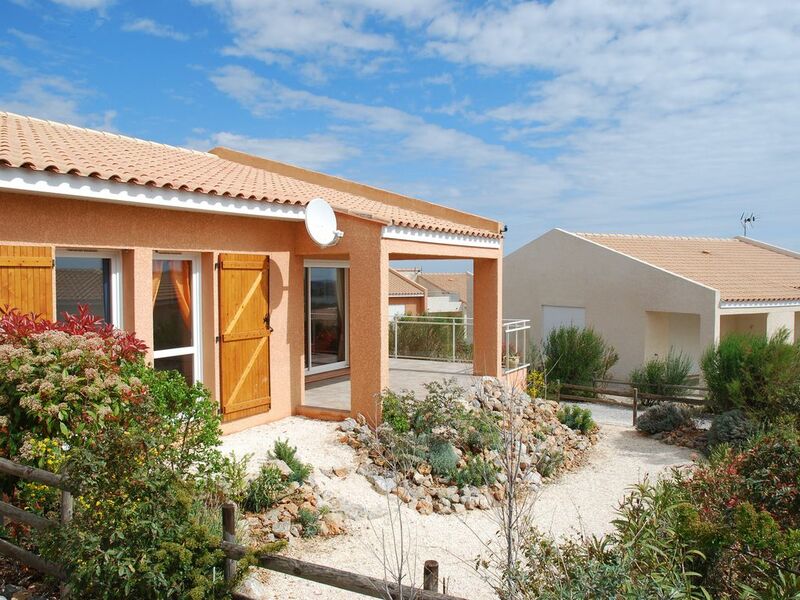 The village has a Post Office, tabac, boulangerie, pizzeria, a Spar shop, doctors' surgery and several very good restaurants (2-4 mins drive or 15-20 mins walk). There's also a good selection of restaurants in Leucate (10-12 mins drive). Here you will find bars, snack-bars, a bank/ATM, local shops, a small Carrefour supermarket with petrol stn (between Leucate and Leucate Plage), and superb sandy beaches (Leucate Plage). Try the famous oyster shacks just off the beach between Leucate and Porte Leucate, where you can eat-in or take away fresh oysters and mussels from the adjacent salt-water lagoon. Should you eat-in, there's no silver service - it's plastic tables and chairs, if you're lucky; but these shacks are very popular and probably supply the best fresh oysters in France - from around 5 or 6 euros a dozen! During high summer an elevated open-air seafood restaurant is to be found on the beach between Leucate Plage and the shacks. It gets very busy, so book a table in advance. Nearby Sigean has an 'African Safari Park' - a great day out for the family, where you drive at your leisure through extensive open parkland with lions and bears etc. roaming freely, (keep car windows and doors closed and locked in these areas!). There are also many lakeside spots where you can see more African wildlife while enjoying a picnic. Youngsters will want to experience the water park at Port Bacares and many other childrens' leisure facilities open in the area during the summer. The Cathar castle sites are a 'must-visit' on your itinerary. Perched high on mountain tops, it's almost impossible to understand how these could be built today, let alone 1000 years ago. All are potentially accessible on foot, although something of a challenge! Booking Notes: A non-refundable deposit of 25% is requested. The balance plus a refundable security/damage deposit of £200 will become due 8 weeks before your arrival. Bookings will normally only be taken in multiples of 7 nights unless otherwise shown. We can sometimes be more flexible out of high season or with last-minute vacancies. Changeover Day: Changeovers are Saturdays during mid and peak summer periods, although there may be some flexibility until the end of May and from the end of September. Arrival is at any reasonable time from 4:00pm with departure by 10:00am. Notes on prices: Weekly rental prices are for 7 nights from 16.00hrs on the arrival day until 10.00hrs on the day after the last night. Prices are inclusive of servicing charges (subject to no excessive cleaning being required) and utilities (subject to reasonable use). Prices shown are for the property per week in GB Pounds.